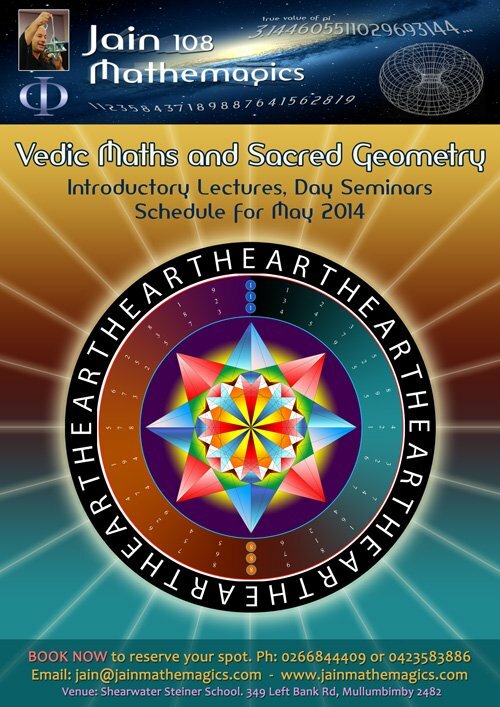 for confirmed lectures and day seminars in Brisbane, Sunshine Coast, Sydney and Melbourne. being held at Bangalow Hall on the following dates in April. (Traditional Pi = 3.141… and is fundamentally flawed). Explore the counter-rotating fields of Sunflowers and Pine Cones based on Fibonacci Numbers and the Divine Proporotion, with Mathemagician Jain. 4pm Jain The Art of Number. The Joining of Numbers (Left Male Brain) with Shape or Picture (Right Female Brain) by Translating sequences of Biology’s Fibonacci Numbers, Binary Code and the Atoms of Creation: Prime Numbers: into sacred Symbols with Jain. Explore the timeless geometric designs of living crystalline forms whose specific shapes belong to the class of 5 Platonic Solids with Mathemagician Jain. The true value of Pi, Jain explores a shift from the disharmonic traditional value of Pi (3.141…), the Circle-Square relationship, towards a new and corrected frequency (3.144…), based on the Phi Ratio (1.618…) that will take Humanity to a Higher Physics. Our mathematicians for 2000 years have fallen prey to a fundamental error in mathematics, posed originally by Archimedes. In the new realm of Fractal Mathematics, we discover that the true value of Pi must be other than we anticipated. His beautifully animated powerpoint presentation shows the depth and wisdom of 30 years of avid research.